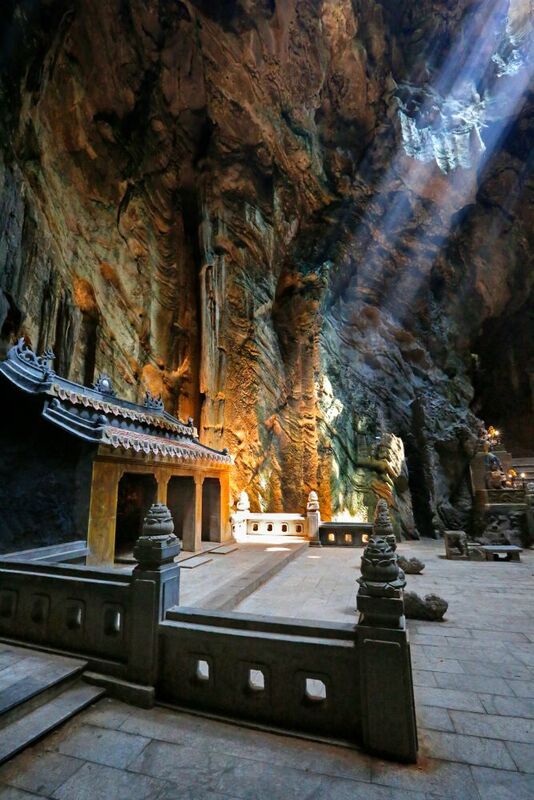 Among the many caves in the Marble Mountains, the most important and beautiful is Huyen Khong Cave or Hospital Cave at Marble Mountain Vietnam. After a steep climb up 156 steps, you then go down a semi-hidden flight of stairs to enter the cave which is flanked by two pairs of administrative and military Mandarin statues there to protect the entry. You can also see a high gallery containing a giant Buddha statue which is illuminated by natural light coming through vents in the ceiling at certain times of the day. The cave was a refuge for Vietnamese revolutionaries during wartime and used as a field hospital. It was bombed repeatedly which lead to the openings in the ceiling.